Meeting the needs of both patients, and healthcare professionals, in today’s fast changing communications landscape can be challenging, particularly against the backdrop of compliance. Putting creativity at the heart of the process can be the most effective way of tackling these challenges. Although the return on investment of creativity is not always easy to measure, the value it can bring to pharma and healthcare is increasingly evident. 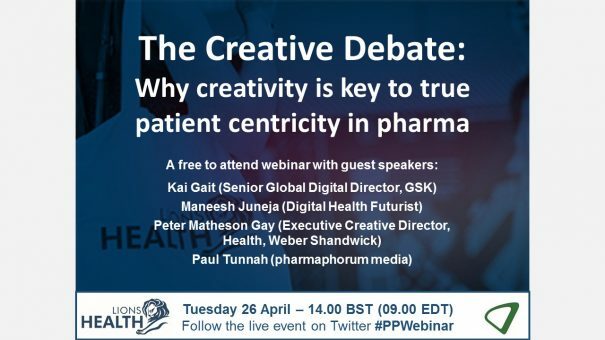 This webinar brings together a wealth of expertise to deliver case-study based evidence, interactive debate and practical advice on deriving competitive advantage from the creative process and ensuring patients are truly at the heart of your business. The live broadcast took place on Tuesday 26 April 2016 at 14.00 BST (09.00 EDT). To view the on-demand version, please click here or on the widget below. Kai is a Global Multi-Channel Marketing Director at GSK, leading a team focussed on embedding digital into the organisation as part of a transformation programme. Kai has spent the past 15 years working around the world, leading digital transformation initiatives and innovation projects for major companies struggling to adapt to changing environments. Kai frequently speaks on subjects such as digital marketing, change management, innovation, social marketing, mobile, using gamification to drive behavioural change and more recently, wearable technologies in healthcare. Kai is passionate for the need for businesses to truly understand their customers, support their needs and provide innovative solutions to their problems. An example of this is where he is currently leading the development of GSK’s first Class I Medical Device app, due for release this year. When he’s not behind a work device, he lives with his passion for technology, travel, photography and being with his family. Maneesh Juneja is a Digital Health Futurist who explores the convergence of emerging technologies to see how they can make the world a healthier and happier place. In 2016, he gave attendees a chance to experience Virtual Reality at the world’s first pop-up Museum of Happiness in London. At the beginning of 2015, Maneesh Juneja was ranked 10th most influential in Wearable Technology, and 8th most influential in Digital Health. In 2012, he left the security of his career at GlaxoSmithKline, to set up his own consultancy, MJ Analytics. In the same year, Maneesh also founded the Health 2.0 London Chapter, which has since become the UK’s largest grassroots health tech community. In a career spanning 20 years, Maneesh has worked with data to improve decision-making across a number of industries. From supporting the Whitehall study at University College London, managing the Tesco database at DunnHumby, and most recently, working with the world’s largest US & European patient databases at GlaxoSmithKline R&D. He holds a BSc in Business and Computing. Peter Matheson Gay is the first-ever global Executive Creative Director of healthcare at the public relations firm, Weber Shandwick. From OTC to Rx, his work has honed in on the patient experience, and what it takes to authentically engage and activate communities. One of his most recent, widely-recognized and awarded campaigns was described as, “cannier, more sensitive to patient needs and just plain more effective than pretty much every other education or awareness campaign out there” by Medical Marketing & Media. Having spent considerable time living in Canada, Europe and the United States, Peter brings a truly borderless approach to creativity with a focus on providing real value through communications. A dedicated volunteer his entire career, Peter has provided support for organizations such as GMHC, Kids Help Phone and AIDS Committee of Toronto.